A deafening silence: The price Egypt could pay for the international neglect of Libya? A once-retired general leading a sweeping offensive against Islamist forces has been named Libyan army chief, the speaker of the country's internationally recognised parliament announced Monday. "I've chosen Major General Khalifa Belgacem Haftar for the post of commander-in-chief of the army after promoting him to the rank of lieutenant general," Aguila Salah told AFP, adding that Haftar would be sworn in before parliament. The internationally backed legislature created the post of army chief under a new law passed last week. A member of parliament said at the time that the law was adopted to "legitimise" Haftar, who calls himself chief of the Libyan National Army. 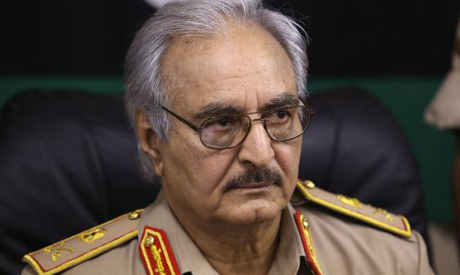 Last May, Haftar launched an offensive against Islamists in the country's east, prompting the then-government to accuse him of trying to stage a coup. But after Islamists seized the capital following elections in June and the parliament fled to the country's far east, the internationally recognised authorities have gradually allied themselves with him. Last month, they formally requested that he and 129 other retired officers return to active service. Since the 2011 overthrow of dictator Muammar Gaddafi in a NATO-backed uprising, Libya has been awash with weapons and opposing militias are battling for control of its cities and oil wealth. There are also growing fears about efforts by the Islamic State jihadist group to establish a stronghold in the strife-torn country. The international community faces a daunting task to find a political solution to the lawless nation's political and military crisis. Fajr Libya, a coalition of militias that seized Tripoli and which backs a rival government based in the capital, has rejected any political settlement that includes Haftar. It is obviously seemed that Libya parliament is following the Egyptian Scenario and very soon Hafter will be the President.What a pity !!!!!!!!!!! He hates Islam, he hates the Quran, and he hates the Prophet Muhammed. He also carries a lot of innocent blood on his hands. In short, he is a terrorist. Finally he colludes and connives with the enemies of Libya, like Sissi, in murdering Libyan woen and children.